Artists presenting their debut album usually draw heavily on their influences, and end up sounding like them, in a watered down way. Danish bassist Casper Nyvang Rask takes a different tangent, assembling his "Slow Evolution Ensemble"five reeds, two drummers, and two double bass playersto create a unique and personal sound of an engaging avant-garde variety. On the personal side, three of the six original compositions explore the intricacies of Rask's experience of the stroke suffered by his father. Indeed, the opener, "Chaffinch (Goodbye Forever)," with its dense an inexorable wash of unison reeds feels like the sound of the universe seeping into a stunned and grieving mind. 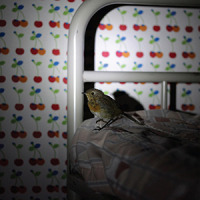 The set's closer, "Slow Evolution in NO871" (room NO871 was Rask's father's hospital room after the brain damage hit) sounds like a loved one's internal symphony, experienced from a chair in a darkened room of a shrouded relative, surrounded by the electronic monitors of failing life systems. And the brief "Chaffinch (Goodbye)" is a second farewell, one that is ultimately less anguished that might be coming from a more accepting-of-the-situation perspective. Where the three tributes to his father unfold in a slow and inevitable evolution, with great patience, outside of time, "Alan Silva, zum Bespiel" tips a hat to American free jazz bassist Alan Silva, with a sound the starts out in a stately manner, that soon devolves into a squabbling chaos that gels into a measured whimsy, while "Threeleggeddog" and "Marzahn" both showcase the ensemble's beautiful interplay in a multiple reeds celebration, soundscapes spiced with a dash of Rask's subtle and deft use of midikeys. And give credit to Gotta Let It Out Records for presenting new talentin 2018 it was pianist Nikita Rafaelov with Spirit Of Gaia; in 2019 it's Casper Nyvang Rask's Slow Evolution Ensemble. Track Listing: Chaffinch (Goodbye Forever); Alan Silva, zum Beispiel; Threeleggeddog; Marzahn; Chaffinch (Goodbye); Slow Evolution in NO871. Personnel: Francesco Bigoni: tenor saxophone, clarinets; Henrik Pultz Melbye: tenor saxophone, clarinets; Mads Egetoft: tenor saxophone; Laura Toxværd: alto saxophone (2, 3 & 4); Lars Greve: tenor saxophone, clarinet (6); Ole Mofjell: drums (6); Bjørn Heebøll: drums; Roberto Bordiga: double bass; Casper Nyvang Rask: double bass, all keys.